A recipient of the Joseph W. Polisi 'Artist as Citizen' Award, Marcus balances his creative pursuits with an active effort to give back to communities on his doorstep and around the world. 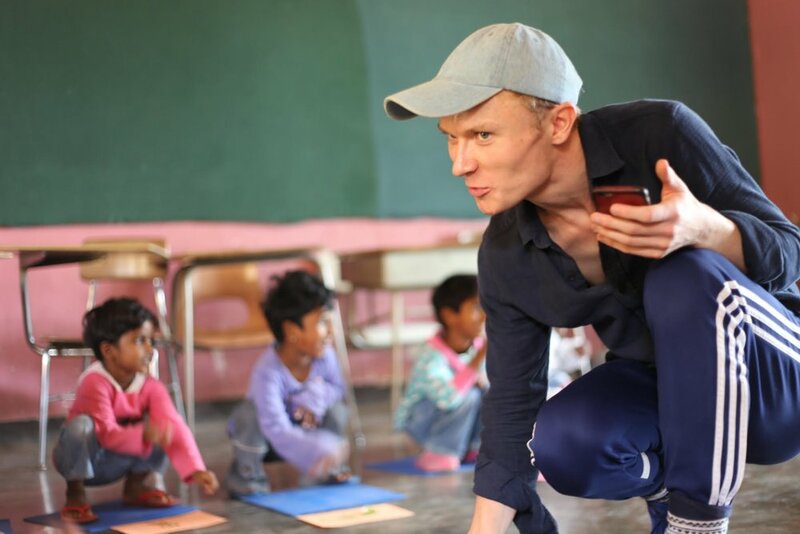 His work teaching has taken him through all 5 boroughs of New York City as well as Rhode Island, Florida and as far afield as rural Tanzania, Kenya and most recently, Southern India. Marcus is always in search of new opportunities to teach, share, empower and indeed learn from students around the world. Marcus has been confirmed as a speaker at the 2017 FAAE Annual Summit in Daytona Beach, FL. On June 24th he will present "Cross-hatching: An Actor Learns from a Visual Artist" & speak on a panel about arts activism & social justice. In April, stART Osceola hosted Seattle-born Jazz Quartet, The Westerlies, the second in a new workshop series funded by Dr. Phillips Charities and produced by Marcus. They worked with high school band students throughout the district, spoke to the parents of aspiring musicians and played concerts in Osceola County and Downtown Orlando. Marcus will teach alongside, Kelsey Lake, as a Jennifer Saltzstein Kaffenberger fellow at the Refugee Youth Summer Academy program hosted by ASTEP. Frank Zwally, a student of the stART Osceola Summer Program, and student of Marcus' was accepted to Group 50 at The Juilliard School. Disney did a write up on his success here. Marcus taught Drama master-classes in his home county, Renfrewshire, where arts programming is minimal. In June, Marcus spoke at the 2016 Annual Summit for the Florida Alliance for Arts Education in Daytona Beach, FL. Marcus wrote for the Teaching Artists' Guild Quarterly publication about stART Osceola. This profile can be found in the Summer 2016 issue published here. In November, Marcus led workshops with the Community Music Works program in Exeter, RI on their all-student retreat. Read his blog post here. stART is an annual fine and performing arts workshop for Osceola County School District students with creative aspirations. The two-week workshop and newly launched Spring and Fall workshops aim to prepare students for a college-style intensive experience by offering them tuition from early career professionals or artists in training. Learn more. Marcus has served as a teaching artist since 2011 and Co-director & Teaching-artist coordinator since 2013. Marcus has been an active ASTEP volunteer since the beginning of 2016 serving at a number of facilities throughout NYC and around the world. Marcus is always looking for new opportunities to collaborate with new students, speak with communities & expand his knowledge of the world through cultural exchange.